Port Authority Toll Increases: Were They Enough to Modernize Our Infrastructure? 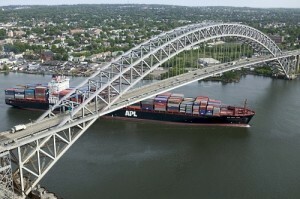 Sep 12, 2011 // by PlanSmart NJ // Speaks Out Blog // Comments Off on Port Authority Toll Increases: Were They Enough to Modernize Our Infrastructure? On August 19th, the Port Authority of New York and New Jersey Board of Commissioners approved a two-part plan to restore fiscal health to the agency by increasing toll and fare rates. A scaled down version of the original plan will raise $25.1 billion, generate more than 131,000 jobs and will focus attention to safety, security and state-of-good-repair projects, including completion of the World Trade Center, while phasing in other less immediate projects over more than 10 years. The scaled down version of the plan limits the opportunities for infrastructure improvements. Chris Ward, Executive Director of the Port Authority, described the plan negotiations in a speech at the New York Building Congress,”We emerged [from talks] with a toll and fare strategy, a 10-year capital plan that I would argue is far too modest . . . not one that expands this region in any transformative way,” Read more about his speech in the New York Post, here. PlanSmart NJ supports the investment in regional economic health through infrastructure updates. In an August 26 Op-Ed in The Record, Lucy Vandenberg outlined the case for the cost increases, benefits of the investment and dangers of failing to act on this important matter. At the time a more aggressive proposal was being considered which would have provided 185,000 jobs in the region and been a $33 billion investment. To read Lucy’s Op-Ed, click here. To learn more about PlanSmart NJ’s support for the Port Authority of NY & NJ, click here to read our August 9th Press Release. What do you think? Would it have been better to raise tolls higher to get the infrastructure investment we need for the region? Let’s discuss it on our Facebook wall- www.facebook.com/plansmartnj.